Taipei, Feb. 19 (CNA) The Republic of China (Taiwan) will not align itself with China in dealing with issues related to the disputed Diaoyutai Islands in the East China Sea, Ministry of Foreign Affairs spokesman Steve Hsia reiterated Tuesday. "It is crystal clear that the Diaoyutai Islands are part of our inherent territory," Hsia said at a regular news briefing. "Our sovereignty over the island cluster is a premise for our fishery talks with Japan," he added. Hsia's remarks came a day after President Ma Ying-jeou once again ruled out aligning Taiwan with China in the sovereignty dispute over the Diaoyutais, which have been under Japan's administrative control since 1972 but are also claimed by Taiwan and China. Ma told a group of Taiwanese businessmen operating in China that his administration will not budge an inch on the country's sovereignty claim over the island chain. "With somebody who has studied the issue for 40 years as its president, the ROC is not likely to back off from its stance," Ma said. He cited three reasons to explain why Taiwan cannot join hands with mainland China in dealing with the dispute over the Diaoyutais. First, China's denial of the Treaty of Taipei signed by the ROC and Japan has made it impossible for the two sides of the Taiwan Strait to work together on the issue, Ma said. The peace treaty, signed in 1952, formally ended the state of war between the two countries, with Japan renouncing "all right, title and claim to Taiwan and Penghu as as well as the Spratly Islands and the Paracel Islands." Second, Ma said, China has not yet responded to his "East China Sea Peace Initiative" since he unveiled the proposal last August. Based on the idea that "sovereignty cannot be shared but resources can be divided," Ma outlined a two-stage approach to tackle the simmering Diaoyutai dispute, saying negotiations among the three claimants to the islets -- Taiwan, Japan and China -- can begin along three parallel tracks. Those discussions would then converge into single track trilateral negotiations on the conflicting claims to the uninhabited island chain, according to Ma. The peace initiative also calls for all parties to refrain from provocations, shelve their differences, maintain dialogue, observe international law and resolve the dispute by peaceful means. Third, Ma said, was China's call for Taiwan not to touch on the sovereignty issue in talks with Japan on fishing rights in the region. 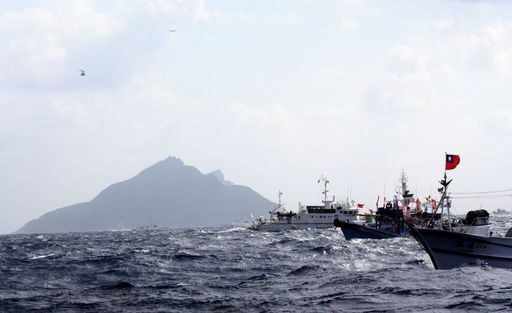 "Without sovereignty, there would be no fishing rights in the Diaoyutai area. How can we not touch on sovereignty issues in fishery talks with Japan?" Ma said. But the president added that armed confrontation is not the best way to resolve international disputes. "In the international community, we need to resolve disputes by peaceful means," Ma said. Hsia said the president's explanation of Taiwan's stance on the Diaoyutai issues was unequivocal and would not allow collaboration with China in settling the dispute with Japan. He also revealed that another preparatory meeting for Taiwan-Japan fishery talks will take place late this month or in early March. The first such meeting took place on Nov. 30 in Tokyo, with little progress being made. Located 100 nautical miles northeast of Taiwan, the island chain is closer to Taiwan than to Japan or China, and waters in the area have been a traditional fishing ground for Taiwanese fishermen. They have been unable to fish there in decades, however, kept away by Japanese authorities.